We always have cereal in our pantry. How about you? Cereal is eaten at breakfast, lunch, dinner, snack time or really anytime someone needs a bite to eat. Cereal is an easy kids in the kitchen menu item! I'm a huge believer of buying what the kids will eat and we seem to always have the same 5 or so cereals on hand. 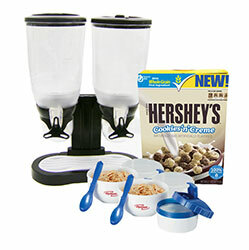 If they see a brand new cereal advertised we usually wait until I have a coupon which is how we tried the new Hershey's Cookies 'n' Creme Cereal. Now I offer the coupon to you as well as a giveaway! The information and prize pack have been provided by General Mills through MyBlogSpark. My own opinions are expressed here. Here is a coupon for $1.10 off a box of the cereal while supplies last. 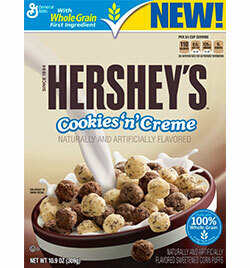 The new Hershey's Cookies 'n' Creme breakfast cereal from Big G is on the shelves. Have you seen it? Have you tried it? Big G has produced another cereal with 100% whole grains with at least 14g of whole grain per serving! The sugar is only 9 grams per serving and is a good source of Calcium, Vitamin D, and 10 other essential vitamins and minerals. Sounds like Big G is at it again! They are thinking about their products before putting them on the shelves. Besides the facts from the company, the cereal is tasty with or without milk. I snack on it without milk but the kids of course enjoy it with milk. What is your favorite Big G Cereal? Enter in the below Rafflecopter form to win the prize package listed above. 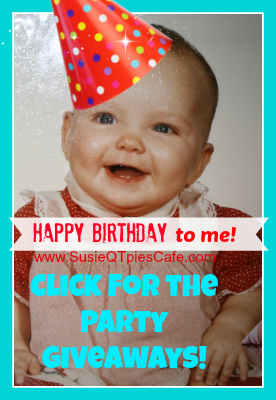 Super easy to do and it is part of my Birthday Celebration week! I listed 2 giveaways yesterday and plan on having a new one every day this week! I love Reese's Peanut Butter Cups Cereal. Thanks for the chance to enter. My favorite General Mills cereal is Cinnamon Toast Crunch. Our family loves Cinnamon Toast Crunch. I can't keep enough in the house! Cinnamon Toast Crunch is the favorite in our house! Cocoa Puffs are my favorite. Cheerios is my favorite! Just plain original. I love Honey Nut Cheerios, thanks!